Hello! 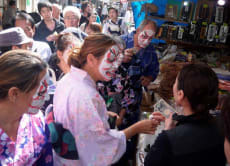 We offer slightly strange ways of explore Tokyo: sightseeing in Tsukiji Fish Market with Kabuki make-up, attending a fish-cutting class, and other interesting activities. Let's enjoy Tsukiji area together! Tour Tsukiji Fish Market in Kabuki Makeup! 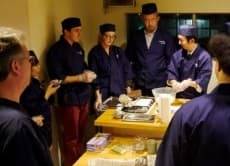 We were very (inexcusably) late to our lesson due to bad planning / address misunderstandings on our part, but the host and sashimi instructor were both extremely accommodating and let us get in a "speed" lesson - which was still so much fun! 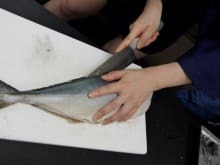 The behind-the-scenes, hands-on experience of cutting a fish and preparing it sashimi-style was interesting and informative. Eating it at the hotel later was a fun, fresh treat. I did not love my experience. First of all, it was expensive. We cut three different fish and I did learn how to cut the fish. However, the cutting board and the knife were not so clean at all. The location was not good, difficult to find, and although I arrived on time, they started without me as I was waiting outside and they did not come get me. The English translation was so-so. I think another cooking activity would provide greater value. Could be improved greatly.